The Secretary-General was shocked by and condemns the brutal killing of Boris Nemtsov in Moscow on 27 February. The Secretary-General notes that an investigation into this murder has been announced, and he expects the perpetrators to be brought to justice swiftly.The Secretary-General wishes to express his deepest condolences to Mr. Nemtsov’s family, friends and supporters. 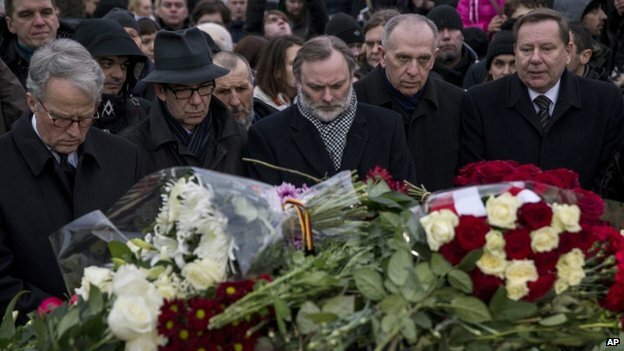 Thousands of people have paid tribute with candles and flowers at the site in Moscow where leading Russian opposition politician Boris Nemtsov was shot dead. An opposition march which Mr Nemtsov planned in Moscow for Sunday has now been turned into a memorial rally. President Vladimir Putin condemned Friday’s killing as “vile and cynical” and vowed to find the killers. But Mr Nemtsov’s allies said this was a political killing linked to opposition to Mr Putin and the Ukraine conflict. As night fell, flowers were piled up a metre high and two metres wide on the Great Moskvoretsky Bridge. Placards read: “We are all Nemtsov” and “Je Suis Boris” – the latter a reference to the Je Suis Charlie messages of support following the Charlie Hebdo killings in Paris last month. There is now a mountain of flowers on the spot where Boris Nemtsov was shot, right next to the Kremlin. People have tied bouquets to the wall of the bridge, and to lampposts. They have brought photographs, handwritten posters and poems. One proclaimed “Je Suis Boris”, another read in red ink, “Boris, they were frightened of you.” To one side, a man stood alone with a banner: “4 bullets in you are 4 bullets in me”. Amidst the flowers and candles are flyers for the opposition rally Boris Nemtsov had been helping to organise on Sunday. Instead, the crowds will gather for a march of mourning. Former UK ambassador to Russia, Sir Tony Brenton, told the BBC there was now “an atmosphere of political hysteria in Russia”. Russia’s Investigative Committee said it was looking into a number of possible motives, including Mr Nemtsov’s opposition to the Ukraine war, his political and personal life, Islamic extremism or an attempt to destabilise the state. A number of pro-government figures suggested Mr Nemtsov had been made a sacrificial victim to show the state in a bad light. Ramzan Kadyrov, the Putin-backed leader of Chechnya, blamed “Western special services, trying by any means to create internal conflict in Russia”. Presidential spokesman Dmitry Peskov said Mr Putin had noted “that this cruel murder has all the makings of a contract hit and is extremely provocative”. Others suggested there could have been personal enmity over his private or business life. Lawmaker Vladimir Zhirinovsky said the murder could have been connected to Nizhny Novgorod where Mr Nemtsov had been regional governor in the 1990s. Mr Nemtsov was reportedly preparing documents on Russian military involvement in Ukraine. US President Barack Obama condemned the killing as a “brutal murder”. The Russian government must conduct a “prompt, impartial and transparent investigation”, the US president urged. Mr Nemtsov, 55, had been dining at a restaurant with his girlfriend Anna Duritskaya on Friday night. They left together to walk to his flat, crossing the bridge, where a white car drew up and Mr Nemtsov was shot four times with a pistol at around 23:40 (20:40 GMT). Footage on Russian TV showed a white Lada Priora car in the area but there was no confirmation it was the one involved. One shot showed someone running along the road and jumping into the waiting car, which sped off. In a telegram to Mr Nemtsov’s mother, published on the Kremlin website, Mr Putin vowed to bring the killers to justice. He praised Mr Nemtsov’s openness and honesty. 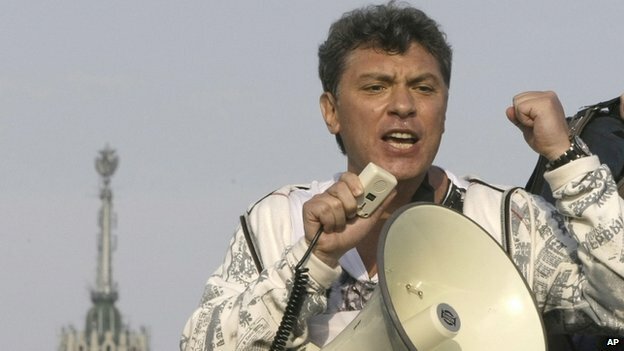 Mr Nemtsov served as first deputy PM under President Boris Yeltsin in the 1990s but fell out of favour with Mr Putin and became an outspoken opponent. He told the weekly Sobesednik recently that his mother was worried about him. Moscow’s authorities have agreed a march of up to 50,000 people can be held on Sunday. It will begin on Kitaigorodsky Proezd at 15:00 local time (12:00 GMT) and pass the site of the killing. Posted on 28th February 2015 by newsafrica. This entry was posted in Africa. Bookmark the permalink.